GPS Address: 199 Arnold Rd. Sturbridge, MA 01566. Orchard and Brewery Website. Sturbridge, MA is home to a gem of a disc golf course, orchard and brewery. I can’t omit the “orchard and brewery” from the title, because it legitimately adds to the experience. With fields full of apple and peach trees, as well a brewery and bar serving a great selection of home-brewed beers, the disc golf actually takes a back seat in terms of making this place a must-see destination. However, as we all know- the avid disc golfer never actually lets disc golf take a back seat. First off, if you’ve never played Hyland Disc Golf course, MAKE SURE TO SIGN IN AND PAY! I hate capital letters, so I use them only because there seems to be a ton of people abusing the honor system of paying and signing in. Even if you have a lifetime membership, you have to sign in for liability reasons. I won’t go into the entire lecture, but needless to say, if enough people keep screwing things up, you get the feeling that the owners will just close the disc golf course to the general public and make it private. It IS private property, and they already have a well established orchard and brewery. It’s only $5 dollars, and that is an all-day rate. The course is new, and if the owners get a real sour taste from the disc golfers, it just won’t last. ALSO, DON’T EAT THE APPLES! 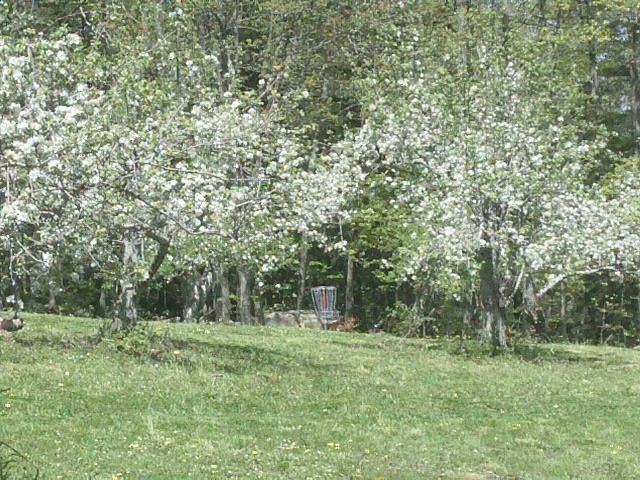 If you’re playing disc golf, you haven’t purchased any of the apples in the orchard- so you don’t have a right to eat them. There’s really no grey area here, and if every disc golfer snagged an apple… bla bla bla. But all that stuff aside, this course is top notch. Right now, in late December 2011, there are some sparse areas in regards to trees and grass- but much of that is due to the massive wind storm that came through in November. All the holes are playable, and about 90% of the fairways are clean. I can only imagine how beautiful this course is in the spring and summer months (see picture above!). In terms of layout, I really enjoyed the mix of distance and trees. There are a few long holes, a few short holes, a few open, a few wooded and everything in-between. For the most part, I don’t think the course favors righty or lefty (if I HAD to choose, I’d say it’s slightly righty-friendly). The open field shots are all long enough that they remain a challenge to birdie, especially in the wind. They are 340 feet, 380 feet, and 400 feet and so on… as opposed to under 250. The signature hole is Hole #13, a 540 foot Par 3. It plays downhill, but it’s in the woods. While it is fairly open for a wooded shot, it’s anything but a gimmie. The tee-box is up on the edge of a steep hill, with a big drop off/ravine at the edge. The grade then comes back up to about 75% of the original height, where it then gradually descends to a blind basket just about straight ahead. Playing downhill typically makes a hole feel shorter, but with all the trees to avoid, as well as the shape of the ground, it really tests your arm and disc selection. And to top it all off, there is OB on the right side, along the stone wall which runs the whole length of the hill. If you score a 3 on Hole 13, you’re likely to gain a stroke on your competition. The baskets are all in great shape. They could stand to put a few beefy, bright yellow flags on them in my opinion- as it would make them easier to spot. The signs are helpful, but hand-made, so they may not last very long. Each tee-pad differs slightly in material and quality- however, they’re all made of some sort of fly-pad or mat, so they all get at least a 75% approval from my perspective. I tend to be a tee-box snob, so a 75% approval is mostly referring to the type of mat they use, and shape of the surface. I believe it’s the typical roll of rubber fly-pad that many courses use- but it tends to get slippery when wet, and it also lets water puddle up quite a bit if the grade beneath isn’t done correctly. For the most part, it looks like they give attention to tee-boxes as needed, so I would expect them to improve with time. I’m still an advocate of pavers or cement when possible, and when using rubber of any sort, the thicker the better (like 1”, not 1/2”), and the prep has to be tamped down really well. Parking here is easy, but can get a little muddy. In the end, if you haven’t played Hyland’s Disc Golf yet, and you live in the area- you should. And if you live far away, it’s worth a trip. At the end of your round, you can go to the brewery bar, and either celebrate, or drown your sorrows! The beer I tried was tasty- and I assume it’s all pretty high quality. I’m going to clear my schedule out and make sure I play whatever tournaments are held out at Hyland’s in 2012. They have a great course, beautiful land, and entertaining facilities. There’s even a barn sized, open bar and stage near hole one. It’s big enough to entertain hundreds of people, serving them home-brewed beers and playing live music for them. Get out to Sturbridge and play this place! …and grab a beer. This entry was posted in Course Highlights and tagged brewery, course, disc, golf, hyland, orchard, review, sturbridge. Bookmark the permalink.